I was cleaning out a closet in my back room and I came across something that I had purchased a while back and stored away. It was a beautiful antique jar. As I was sitting there admiring it’s design, I began to wonder what I would do with this lovely piece of art. Even though I knew it had at one time sat in someones kitchen filled with cookies, that is not what I envisioned for it. 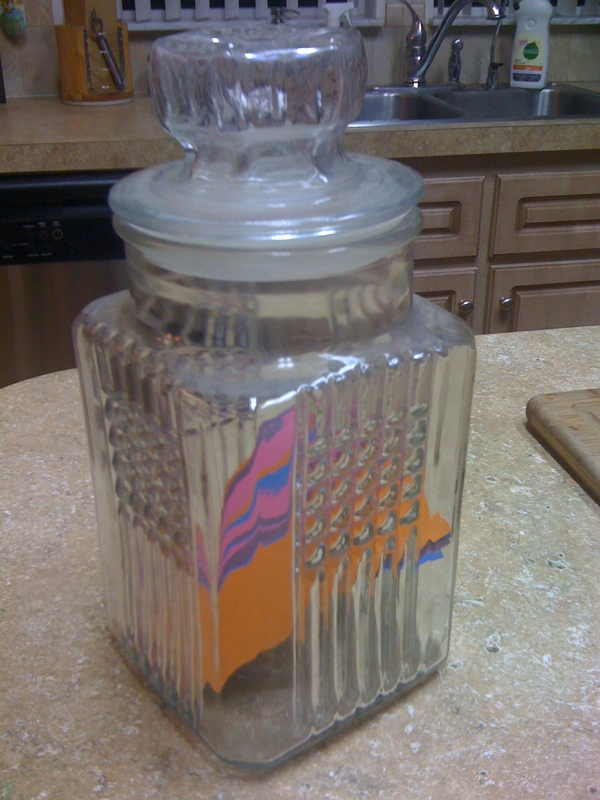 And then it dawned…a Gratitude Jar, of course!! I took a package of colorful index cards, cut them up and began to write all of what and whom I am grateful for in my life. Then I placed them in the gratitude jar and closed the lid. Now at any given time, I can reach in there, pick a gratitude card out and it will remind me to be more thankful for what ever is written on the little card. 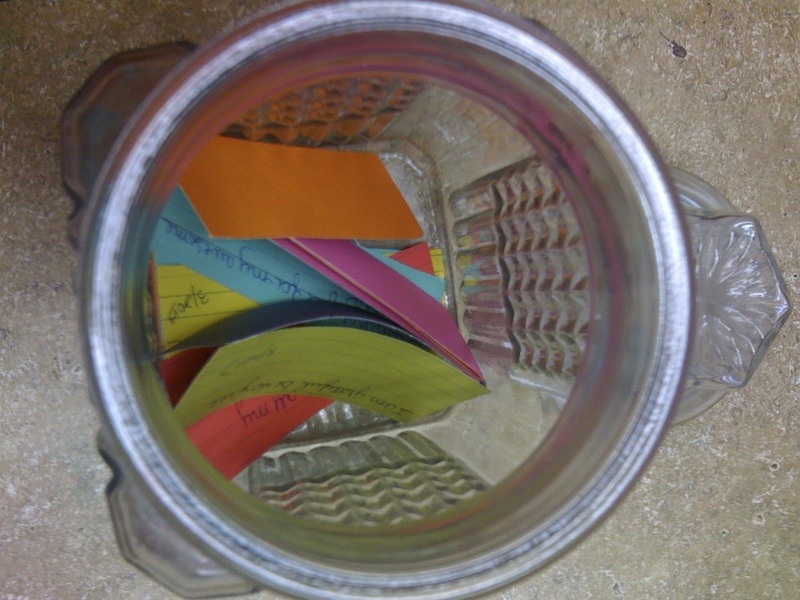 Also , at random, I add even more cards to the jar… always thinking of things I can be thankful for. I especially appreciate having this little gem for many reasons. Other than the obvious, there are times when I may feel overwhelmed, scared or angry. It is in those times when the treasures of what this jar holds becomes invaluable to me. I personally feel that nothing will pull me out of being in the space of the darker energies in life faster than gratitude. Well, there is always raw vegan macaroni and cheese, tee hee. Seriously, all joking aside, being thankful makes me instantly begin to feel more trustful of the present moment. Which turns my attitude regarding the future just a bit more bright. Practicing gratitude is like anything else in life. I recall the day I decided I wanted to become a really great artist. I could only draw stick people at the time. Yet I began to practice everyday. And before I knew it, I could actually draw and paint something I became proud of. And as time goes on, my creations become more seemingly effortless. Gratitude works this way as well. Keep practicing and one day you will wake up and know that it is your natural state of being. And when that magical moment happens, you will master one of the great secrets of the universe. Do you have something like this sitting around your house collecting dust? If you do, I encourage you to turn it into a gratitude jar. It’s fun, and so empowering to have something that is ever there to remind us of how to be grateful for what we have and need in order to truly manifest more of the whispers of our hearts. Beautiful and perfect. Love you. Love this, Jules. Your spirit is so beautiful!